Who needs a car? Whether you’re carrying heavy veggies from the farmers market back to your office, or you’re heading to the train station with an oversized suitcase, you no longer need to drive or trek on foot. Providence’s first pedicab company, Eco Pedicab, has been operating all summer and plans to continue through the fall. Ready to hop into the back seat? Call (401) 400-2380 to schedule a ride, or flag down a cab on its daily downtown route between noon and 3 AM. Tom Olson, the owner, hopes to expand his fleet of two zero-emission pedicabs soon to include egg-shaped cabs with electric motors and awnings. Tom sells a unique experience as he carries passengers throughout downtown and surrounding neighborhoods. As a student at Aquinas College in Grand Rapids, Michigan double majoring in business and art with a minor in economics, he won a summer scholars grant that allowed him to start the company. After researching more than 20 other pedicab companies across the country, he decided to launch the company in Providence, where a friend lived. He offers rides for tips (rather than charging a flat fee) so that passengers can enjoy their tours without worrying about the trips getting too expensive. He supplements his income by offering 20 square feet of eye-level, attention-getting advertising space on each cab. Beyond point-to-point trips, Eco Pedicab offers historic tours that highlight key buildings and events; brewery tours that take people from Trinity Brewhouse to Union Station Brewery; and Taste of Providence tours that feature Aspire, Hemenway’s and Cassarino’s. Three adults can sit comfortably in the back seat, and pets are always welcome. 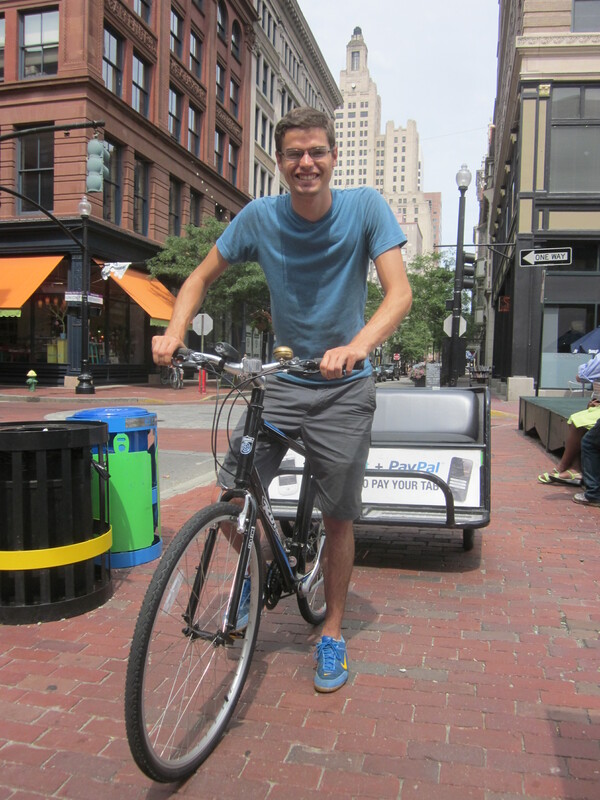 Find Eco Pedicab on Facebook and Twitter, and wave to Tom and his team as they cycle around!